Better health while working means staying conscious of the dietary, exercise, and general wellness habits that are formed in your office. Start promoting workplace health today! There’s no way to transform an office into an environment that supports healthy lifestyles, is there? After all, the American office is the land of sedentary work, endless hours spent staring at computer screens, fast food lunches, and soda-stocked vending machines. This is the case for far too many workplaces. But the truth is, it’s often up to the employees to define the culture of health and wellness within their workplaces. 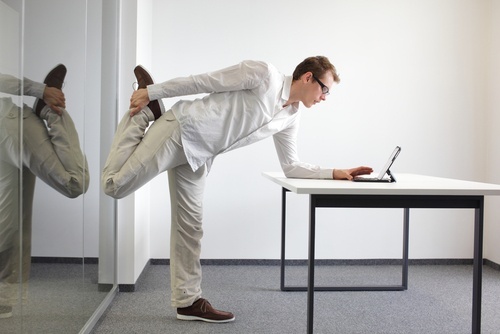 A few small changes can go a long way in making your office and work lifestyle healthier. These tips for better health at work are a great place to start! There’s a lot of confusion these days about the best way to situate one’s self while working. There’s no doubt that sedentary work isn’t healthy for you, but is standing up at your desk better for health at work? As a matter of fact, it is! The American Medical Association warns against sitting for extended periods of time; standing, meanwhile, can increase energy, burn extra calories, increase metabolism, tone muscles, improve posture, and increase blood flow. Thinking about taking the elevator? Think about this: an average-sized person will burn between 6 and 8 calories per minute climbing the stairs. While that might not seem like an enormous number, remember that the number of calories burned on the elevator is exactly zero. Plus, the cardio workout is great for your heart, and the activity tones your legs. That means better health at your work. Got a long lunch break? Use it. If you have a short lunch, you might not have time to do anything but rush through your meal. However, if you have extra time on your break, why not go for a walk, climb the stairs, find a place for some quick push-ups or sit-ups, or even go for a short jog? It’s time far better spent than staring at your cell phone’s screen for an extra half hour. A water bottle, that is. Most health experts recommend drinking about two liters of water daily, so make frequent trips to the water cooler to refill (and burn a few calories walking there as well). Having a water bottle on hand will help you to resist the temptation to visit the vending machine for sugary, calorie-loaded sodas or sports drinks. Try adding some low calorie flavor add-ins as well to further boost your resistance for unhealthy beverages. Great things to add for flavor and health benefits include: lemons, limes, cucumbers, berries, or mint leaves. Try various combinations to keep things interesting! If you’re planning on making a quick run to buy something for lunch during your break, it will most likely be unhealthy. It might be fast food. It might be prepared food from the gas station. But whatever it is, it’s almost definitely less healthy than what you could’ve packed. Packing your lunch puts you in control of what you eat, so pick and pack healthy lunch items like fresh fruits, veggies, and low-fat sandwiches on whole grain breads. Organize an office health program. It could be a weight-loss incentive competition. It could be an exciting office exercise regime. It could be an educational program that informs your office about the best ways to approach diet and exercise in order to get healthy and stay healthy. Organizing an office health program helps to create a culture of better health at your workplace–and Wellworks For You can help. Our team will custom-design a program uniquely suited for you, your coworkers, and your workplace. We spend so much time at work. If we don’t make healthy choices at the office, it can be difficult to maintain a healthy lifestyle. At Wellworks For You, we aim to bring health and wellness to your work and life!